As the tide of data continues to rise, the burden of protecting sensitive data and preventing security breaches can be crushing. 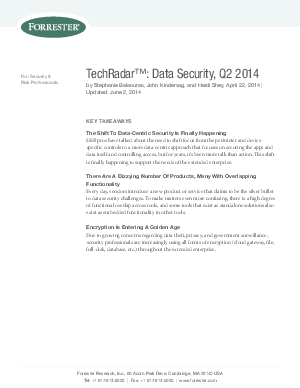 This Forrester TechRadar ™: Data Security report provides a framework for developing a long-term approach to keeping your organization’s information secure. This TechRadar evaluates 20 of the key traditional and emerging data security technologies that can be used to support the key recommendations and best practices of Forrester’s Data Security and Control framework. - Why Do These 20 Technologies Appear in the TechRadar?